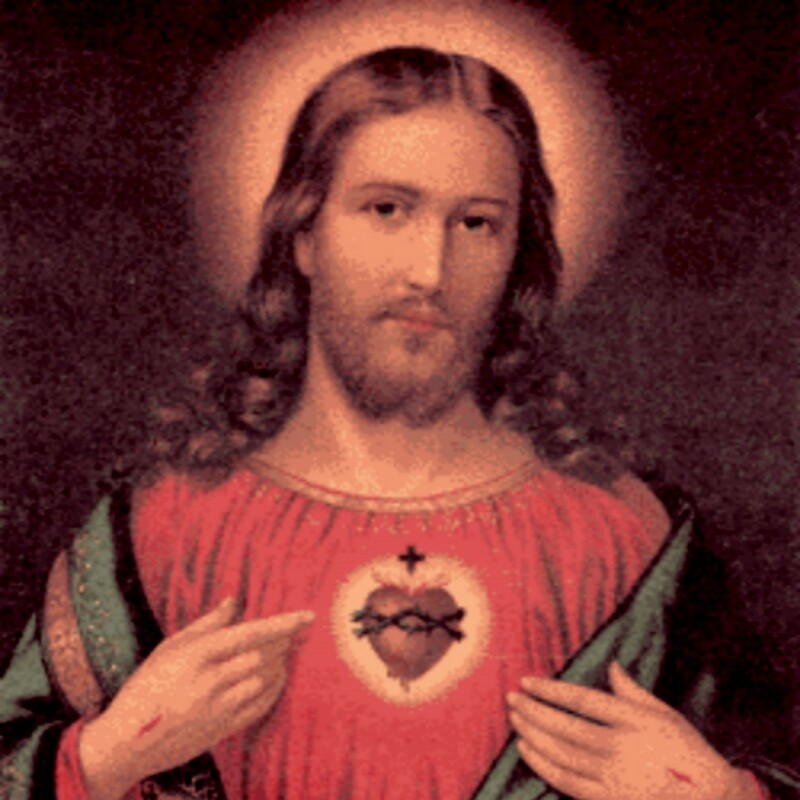 A blessed Feast of the Sacred Heart of Jesus to you! Our Lord Himself asked that this Feast-day honoring His Sacred Heart be established in the Church’s calendar (even specifying the day as the Friday following the octave of Corpus Christi), as a last effort of His love for mankind, by which He would reveal to us the treasures of His Heart. “Behold this Heart, which has so loved men that it has spared nothing, even to exhausting and consuming Itself in order to testify to Its love. In return I receive from the generality of Christians only ingratitude, coldness, irreverence, sacrilege, and contempt for Me in this Sacrament of love. And what is most painful to Me is that they are hearts consecrated to Me. 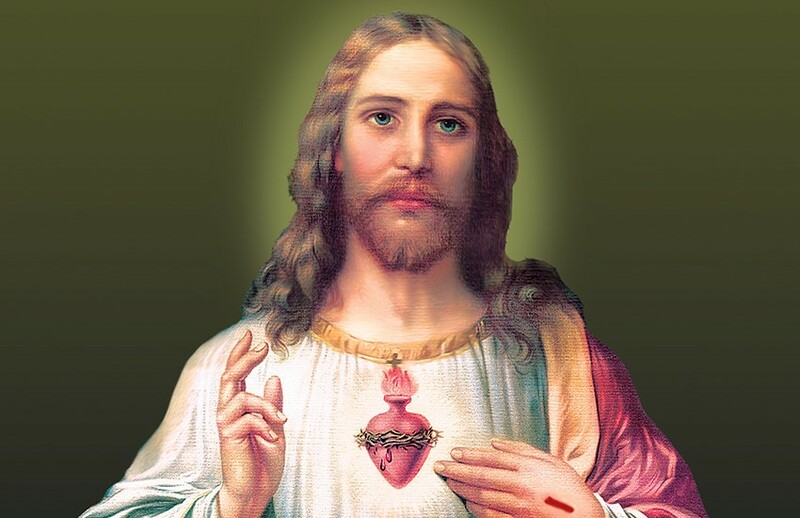 Our Lord’s Sacred Heart, emblematic of the boundless love which induced Him not only to suffer and die for the redemption of mankind, but also to institute the Sacrament of His Body and Blood in commemoration of His death, pleads for our compassion. Today especially, let us demonstrate true sorrow for our own past indifference toward Our Savior’s love and sufferings, and also make reparation for the insults to which His ardent desire to dwell with the children of men daily exposes Him in the sweet Sacrament of His love. Praise to the Divine Heart that wrought our salvation! To It be glory and honor forever! Amen. The infinite love of the sacred Trinity, which calls us frail creatures to a participation in its own blessed life, would accomplish its merciful design by the help and means of another love, a love more like what we ourselves can feel; that is, the created love of a human soul, evinced by the beatings of a Heart of flesh like our own. From the very first instant of its existence, the human Soul of Christ enjoyed the face-to-face vision of the divine essence; It therefore conceived an immense love for man and for God, which began simultaneously with life, and filled not only His soul, but impressed, in its own way, the Body too. The effect of His love told, consequently, upon His Heart of true human flesh; it set in motion those beatings, which made the Blood of redemption circulate in His sacred veins. For it was not with Him as with other men, the pulsations of whose hearts are, at first, the consequence of nothing but the vital power which is in the human frame; and, later on, when age has awakened reason into act, the ideas so produced will produce physical impressions on us, which will, now and then, quicken, or dull, the throbbings of these our hearts. With the Man-God it was not so: His Heart, from the very first moment of its life, responded, that is, throbbed, to the law of His soul’s love. Today’s Feast shows us how it is through the Heart of the Man-God that the divine work is achieved, and how, through that same Heart, the plan which was conceived from all eternity by the Wisdom of the Father, has been realized. By thus revealing to Gertrude the admirable mysteries of divine love included in the doctrine which attaches to the Sacred Heart of Jesus, the Holy Spirit was, so to say, forestalling the workings of hell, which, two centuries later on, were to find their prime mover in that same spot. Luther was born at Eisleben in the year 1483. He was the apostle, after being the inventor, of theories the very opposite of what the Sacred Heart reveals. Instead of the merciful God, as known and loved in the previous ages, Luther would have the world believe Him to be the direct author of sin and damnation, who creates the sinner for crime and eternal torments, and for the mere purpose of showing that he could do anything, even injustice! Calvin followed; he took up the blasphemous doctrines of the German apostate, and riveted the protestant principles by his own gloomy and merciless logic. By these two men, the tail of the dragon dragged the third part of the stars of heaven. In the 17th Century, the old enemy put on hypocrisy, in the shape of Jansenism. Changing the names of things, but leaving the things unchanged, he tried to get into the very center of the Church, and there pass off his impious doctrines; and Jansenism (which, under the pretext of safeguarding the rights of God’s sovereign dominion, aimed at making men forget that He was a God of mercy), was a favorable system wherewith the enemy might propagate his so-called Reformation. That God, Who so loved the world, beheld mankind discouraged or terrified, and behaving as though in Heaven there was no such thing as mercy, still less, love. This earth of ours was to be made to see that its Creator had loved it with affectionate love; that He had taken a Heart of flesh in order to bring that infinite love within man’s reach and sight; that He made that human Heart, which He had assumed, do its work — that is, beat and throb from love, just as ours do — for he had become one of ourselves, and, as the Prophet words it, had taken the cords of Adam. That Heart felt the thrill of joy when duty-doing made us joyous; it felt a weight and pang when it saw our sorrows; it was gladsome when it found that, here and there, there would be souls to love Him in return. There were then living many men noted for their learning and eloquence; but they would not suit the purpose of God. God, Who so often loves to choose the weak, that He may confound the strong, had selected for the manifesting of the mystery of the Sacred Heart, a servant of His, of whose existence the world knew not. It was a Religious woman, who lived in a monastery which had nothing about it to attract notice. As in the 13th century He had passed by the learned men and even the great Saints who were then living, and selected the Blessed Juliana of Liége as the instrument which was to bring about the institution of the Feast of Corpus Christi, so in this present case He would have His own Sacred Heart be glorified in His Church by a solemn Festival; and He imparts and entrusts His wish to the humble Visitandine of Paray-le-Monial, now known and venerated throughout the world under the name of [Saint] Margaret Mary. The mission thus divinely given to her was to bring forward the treasure which had been revealed to St. Gertrude, and which, throughout the long interval since its revelation to her, had been known to only a few privileged souls. Sister Margaret Mary was to publish the secret to the whole world, and to make it a rare privilege no more, by telling everyone how to possess it. The Sacred Heart of Jesus was a heavenly remedy offered to the world against the chillness which had settled on its old age. It became a touching appeal to all faithful souls, urging them to make reparation for all the contempt, and slight, and coldness, and sins, wherewith our age treats the love of our Lord and Savior Christ Jesus. By thus calling His servant to be the instrument of the glorification of His Sacred Heart, our Lord made her a sign of contradiction, just as He himself had been. It took more than ten years for Blessed Margaret to get the better, by dint of patience and humility, of the suspicions wherewith she was treated by the little world around her, and of the harsh conduct of the Sisters who lived with her in the same Monastery, and of trials of every sort. At last on the 21st of June, 1686, on the Friday after the Octave of Corpus Christi, she had the consolation of seeing the whole Community of Paray-le-Monial kneeling before a picture which represented the Heart of Jesus as pierced with a spear. This picture represented the Heart by itself, encircled with flames and a crown of thorns, surmounted by the Cross and the three Nails. That same year there was begun in the Monastery, the building of a Chapel in honor of the Sacred Heart; and Blessed Margaret had the happiness of seeing it finished and blessed. She died shortly afterwards in the year 1690. But all this was a very humble beginning. Where was the institution of a Feast, properly so called? And where its solemn celebration throughout the Church? So far back as the year 1674, our Lord had, in His own mysterious way, brought Margaret-Mary to form the acquaintance of one of the most saintly Religious of the Society of Jesus then living — Father Claude de la Colombière. He recognized the workings of the Holy Spirit in this His servant, and he became the devoted apostle of the Sacred Heart — first of all at Paray-le-Monial, and then later on, in our own country of England, where he was imprisoned by the heretics of those times, and merited the glorious title of Confessor of the Faith. This fervent disciple of the Heart of Jesus died in the year 1682, worn out by his labors and sufferings; but the Society, in a body, inherited his zeal for the propagation of devotion to the Sacred Heart. At once, numerous confraternities began to be formed, and everywhere there began to be built Chapels in honor of that same Heart. Hell was angry at this great preaching of God’s love. The Jansenists were furious at this sudden proclamation, at this apparition, as St. Paul would say, of the goodness and kindness of God our Savior. The men who were proclaiming it were aiming at restoring hope to souls, in which they, the Jansenists, had sowed despondency. The big world must interfere; and it began by talking of innovations, of scandals, even of idolatry. At all events, this new devotion was, to put it mildly, a revolting dissecting of the sacred Body of Christ! Erudite pamphlets were published, some theological, some physiological, to prove that the Church should forbid the subject! Indecent engravings were circulated, and witticisms, such as indignation can make, were made, in order to bring ridicule upon those for whom the world had coined the name of Cordicolæ, or Heart-Worshippers. But neither human wisdom, nor human prejudice, nor even human ridicule, can withstand God’s purposes. He wished that human hearts should be led to love, and therefore to worship, the Sacred Heart of their Redeemer; and He inspired His Church to receive the devotion which would save so many souls, though the world might not take Heaven’s view. The Apostolic See had witnessed all this, and at last gave its formal sanction. Rome had frequently granted Indulgences in favor of the devotions privately practiced towards the Sacred Heart; she had published innumerable Briefs for the establishment of local Confraternities under that title; and, in the year 1765, in accordance with the request made by the Bishops of Poland and the Arch-Confraternity of the Sacred Heart at Rome, Pope Clement XIII issued the first pontifical decree in favor of the Feast of the Heart of Jesus, and approved of a Mass and Office which had been drawn up for that Feast. The same favor was gradually accorded to other Churches, until, at length, on the 23rd of August, 1856, Pope Pius IX, at the instance of all the Bishops of France, issued the Decree for the inserting the Feast of the Sacred Heart on the Calendar and making obligatory its celebration by the universal Church.